↑ 1,0 1,1 1,2 1,3 1,4 1,5 German National Library, Berlin State Library, Bavarian State Library et al. Record #118803514 // Gemeinsame Normdatei — 2012—2016. ↑ 3,0 3,1 3,2 Richard P. McBrien, Lives of the Popes, 243. ↑ Richard P. McBrien, Lives of the Popes, 243. 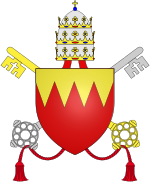 ↑ George L. Williams, Papal Genealogy: The Families and Descendants of the Popes, (McFarland and Company Inc., 1998), 43. ↑ Krakow, Julian Dybiec, Charters of Foundation and Early Documents of the Universities of the Coimbra Group, ed. Jos. M. M. Hermans, Marc Nelissen, (Leuven University Press, 2005), 60. ↑ Richard P. McBrien, Lives of the Popes, 244. ↑ Franklin Daniel Scott, Sweden, the Nation's History, (Southern Illinois University Press, 1988), 79.